Here's a little reminder for my desk [and perhaps, yours] this afternoon. I've been feeling a little defeated here lately. An Open Sketchbook has really begun to thrive. Yay!!! But, as a result, I'm feeling spread incredibly thin and overwhelmed by the rest of life, particularly the Twinterns who need and deserve so much attention these days. It never fails that when I feel as though I'm excelling in one area of my life, I'm lacking in another. Don't ask me the last time I cooked dinner. After taking a much-needed time-out this afternoon, I've decided I needed a new mantra---and this is it. Here's to deep breaths and positive affirmations. Il est vrai que parfois nous courons après les heures sans jamais les rattraper ! 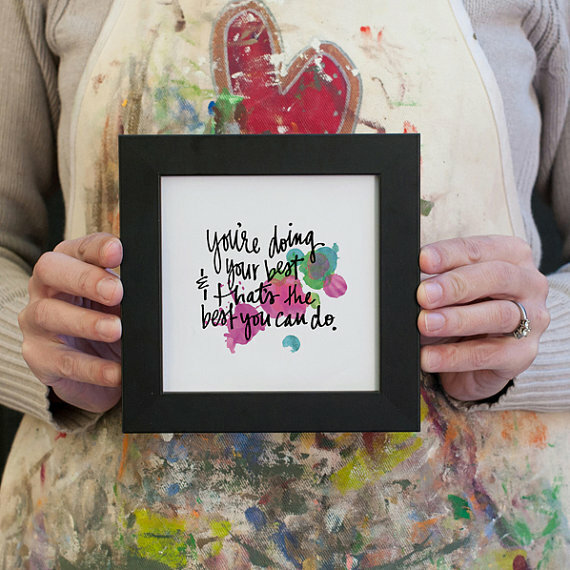 You are doing much much better than you can see right now. You will look back at this time and know item was great. I get this. I really do. I've been having a really hard time lately, and as bad as it sounds, it's nice to know you're not the only one going through something like that. Sometimes you're your own enemy, and seeing everybody else happy and well can put weird thoughts in your head.